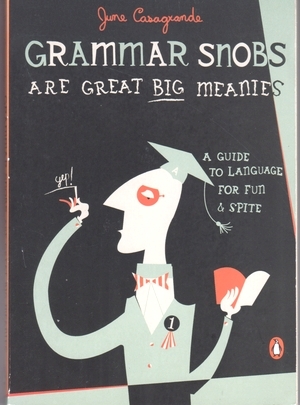 Grammar Snobs Are Great Big Meanies, by June Casagrande. New York: Penguin Books, 2006. 212 pages. Paperback. ISBN-13 798-0143036838; ISBN-10 0143036831. $14.00. Subtitled A Guide to Language for Fun and Spite, this slim volume promises to be a treat for the word maven: a sugar-coated guide to grammar and usage that will entertain while it informs. The author, June Casagrande, writes a weekly column, “A Word, Please,” for several community supplements to the Los Angeles Times, and her proximity to Hollywood seems to have inspired both her chapter titles (“Copulative Conjunctions: Hot Stuff for the Truly Desperate”; “Is That a Dangler in Your Memo or Are You Just Glad to See Me?”) and her breezy tone. With that, Casagrande proceeds to offer 42 bite-sized lessons in grammar, punctuation, and usage. The lessons themselves are not bad. 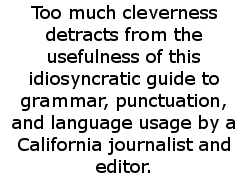 Often drawing on the work of gurus like Strunk and White, they cover subject-verb agreement, the subjunctive mood, dangling modifiers, possessives, and prepositions; along with when to spell out numbers; combining punctuation with quotation marks; “may” versus “might” and “who” versus “whom.” But this reader for one grew tired of wading through chapter titles like “Well, Well, Aren’t You Good?” (on adverbs), “I’m Writing This While Naked” (on predicate nominatives), or “Your Boss Is Not Jesus” (on possessives and words ending in “s,” “x,” and “z”). The absence of an index, meanwhile, makes it necessary to read more than you wanted to know about the author’s battles with yet another “grammar meanie” to find out what the subject of a given chapter might be. Once you get to the hard information, it is often sensible and useful. My favorite chapter (even its title! ), “Eight, Nine. 10, 11—How to Write Numbers,” in two short pages summarizes (and advises following) the Associated Press rules for spelling out numbers and gives clear examples of the most commonly used problems. However, the information is too often buried under too-cute slang expressions, insider jokes based on American television sitcoms and quiz shows, and references to entertainers whose names will be known only to those who are intimately familiar with the popular mass culture of the United States. For my money, that limits this book’s usefulness, and even its entertainment value, for anyone based outside the reach of America’s airwaves. The book’s message, moreover, is often mixed: the reader is never sure just how Casagrande really feels about good grammar and usage. Getting one up on people who make us feel stupid is not ultimately a good motive for learning the rules of style, and the revenge theme soon begins to wear a little thin. If you want to learn more about Hollywood manners and more while imbibing entertaining nuggets of information on participles, conjunction, and hyphenation, give this book a try. If you want a guide to grammar and style that you can refer to and use, pull out Strunk and White’s The Elements of Style. In fact, while you’re at it, get the new edition of Strunk and White’s classic with whimsical full-color illustrations by the luminous and humorous New York artist Maira Kalman (New York: Penguin, 2005; 176 pages; index; $16.47 in hardcover from amazon.com). For a review of another Casagrande book, please see here.